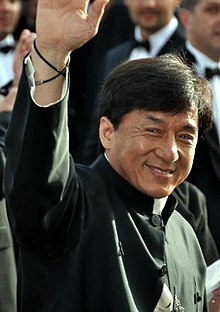 Jackie Chan, SBS, MBE (born Chan Kong-sang, 陳港生; 7 Aprile 1954) is a Hong Kong actor, action choreographer, comedian, director, producer, mairtial airtist, screenwriter, entrepreneur, sangster, an stunt performer. ↑ "No. 51772". The London Gazette (Supplement). 16 June 1989. p. 17. ↑ "Biography section, official website of Jackie". Jackiechan.com. Retrieved 28 February 2012. This page wis last eeditit on 2 Mairch 2018, at 08:33.